Weightlifting increases your heart rate during the short bursts of energy when you lift the weight. This strengthens your heart as well as your other muscles. Knowing your ideal heart rate during exercise is an important method of finding out if you are exercising enough to benefit your heart or if you are over-exercising and putting too much strain on your heart. 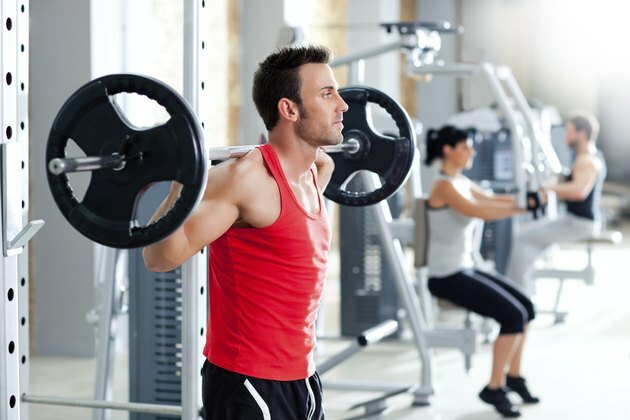 A man's heart rate during weightlifting sessions depends on his age and general level of fitness. The American Heart Association (AHA) recommends strength training, even for men who have a heart condition, providing they have expert supervision. First establish your target heart rate. Then you'll know if lifting weights is putting your heart rate in the AHA healthy target zone or if you're straining it. Subtract your age from 220 to find your maximum heart rate. Your target heart rate during exercise is between 50 to 85 percent of the maximum heart rate. AHA suggests you start by aiming for the 50 percent of your maximum rate to begin with and gradually increase to 85 percent. Medicine and Science in Sports and Exercise: Heart Rate Dynamics After Combined Endurance and Strength Training in Older Men. Is Tropicana Orange Juice Good for the Heart?